So, the other day, we were off to see LeBron not only NOT score his 30,000th point, but at a game where we were up by 23 points and ended up winning by 1 in the final two seconds! That's Cleveland sports for you in a nutshell. I think LeBron has 12 points the entire game. SAD! - as BLOTUS might say. 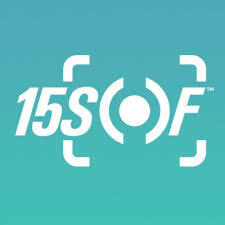 But while 710 and I were attempting to meet up at home, calling during our respective commutes, he tells me about this app people at work mentioned: 15SoF. Or for us non-millennials: 15 Seconds of Fame. Did Andy Warhol lie to us? Or has instant gratification become so instant that we can't be bothered to count our potential and promised fame in terms of minutes? Anyhooo......15soF. It's an app that, let's say you go to a Cleveland sports match, after the fact it will scour any and all of the televised shots and using facial recognition software, will search for you and send you the clip of you at the game. Oh don't get me wrong - this could be horribly horribly creepy. It's got NSA and George Orwell written all over it. And it's all at your own hand. YOU have to provide the image they use to search you out. YOU have to give your phone number and any other contact info. YOU have to tell them what event you are attending. YOU have to give them permission to send you the video. I will say, for blog purposes only, I downloaded and used the app.......to no avail. Our seats are never where the cameras go. I'm never on the dance cam, or kiss cam. I'm too high up in the rafters. But man-o-man, those people who do get on those eat it up. Of course, with those cams, I love it more when people don't know they're on and they're ironically playing with their phone. If they had the app and just looked up from their screen, they'd have gotten that clip emailed to them. Now, my sister could get this and be on it all the time. Her seats at the Cavs game are right at the edge of the tunnel the team runs in and out of. She'd never touch this app. As is no surprise, I did not get any clip emailed my way. I'm still waiting for my 15 seconds.